I checked in at Gatwick Airport on Saturday, the third of December, with three very large dive bags containing all the necessary equipment to make a descent, hopefully, to the deepest wreck ever dived. I arrived at Sharm El Sheikh airport to be met by my deep diving buddy, Leigh Cunningham, who drove me to my hotel. Leigh was describing to me how the last two weeks prior to my arrival had seen perfect conditions for diving Yolanda reef with very little wind and smooth seas. Of course, with the luck we had been having with this project, it was bound to all change. I cast my mind back to May when we started the project. All went well until I received a dose of Pharaoh’s revenge and spent the last part of the week wrapped up in bed while Leigh discovered the bow of the wreck in 145m. After a good night’s sleep, I travelled down to Trafco jetty to meet the dive boat supplied for the project by Seamus and Anna of Colona Dive Centre. They had also supplied the boat last time. The team was already aboard busy preparing equipment and making ready for Leigh and myself. 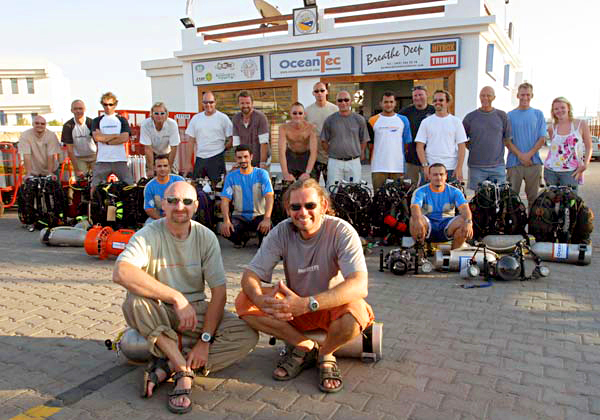 The team consisted of multi-national technical divers from Sharm El Sheikh and Dahab, Most of them I had worked with in the past and some were new to me. 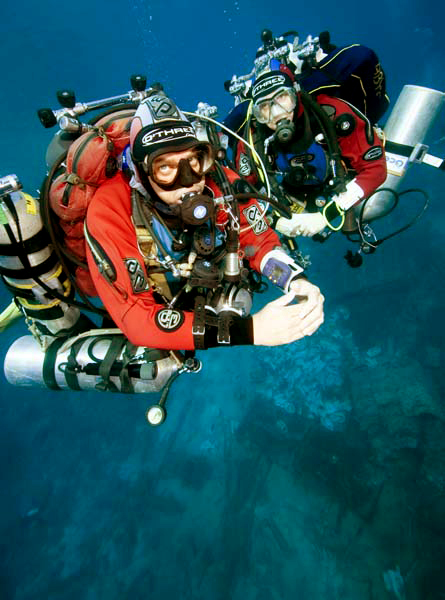 All shared a common interest and a passion for technical diving. It would assure that this week would be a success. The weather was holding out for us, and we steamed out into flat blue seas with little to no wind. The first day was spent at a local dive site making the deep dive rigs and ensuring that all the equipment was working as it should. I decided to use my triple 300-bar Worthington carbon/steel combination cylinders for this dive. This would allow me to wear one less cylinder than Leigh and offer a less dramatic profile in the water. Leigh decided to wear his trademark dive rig of twin twenty litre cylinders with a twelve litre strapped to either side and two fifteen litre tanks as stages, thus making a six-tank configuration. The problem I had with my rig was that there was nowhere in the Sinai that had a 300-bar compressor system... That is, until now. Chad Clarke, a familiar face in Sharm, has opened an all new pumping and gas blending station next to Trafco jetty (Ocean Tec) and agreed especially for this project to install a 300-bar system. How’s that for service? You are a star Chad! Leigh and myself spent the first day tinkering with the dive rigs. The team took the opportunity to study the rigs and fully familiarise themselves with their operation. They wiere going to be responsible for ensuring that we had all the right equipment in the right place prior to each dive. Later in the day, we made a 100m dive to ensure all was well—both with us and the rigs. The second day, we were out to the dive site itself and made another 100m dive. This time, we had the full dive team in the water simulating the big dive itself. Apart from diving to over 200m, the hardest part of this dive was that it was all done with no shot lines—free descent and free ascent being the order of the day. 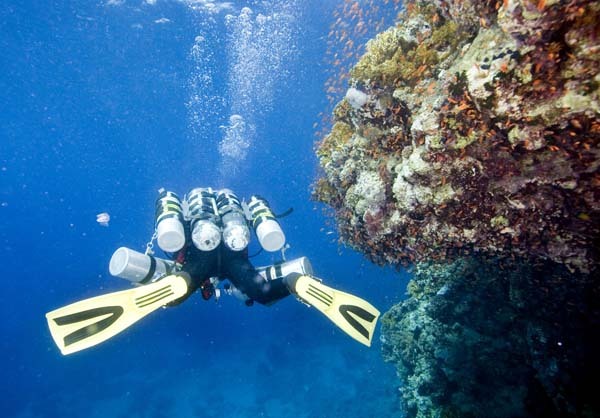 The safety divers needed to be experienced in blue water diving with no visual reference of lines or reefs. Both Leigh and I decided not to have safety divers deeper than 30m on the big dive itself due to the fact that we would be carrying all necessary gas for the entire dive and would prefer to be alone during the busier parts of the ascent, which required great concentration of ascent speed and gas switches. The idea was to deploy DSMB’s at 30m. Each of us would have two support divers descend down the line to greet us with spare gas, if needed, and in-water hydration packs. 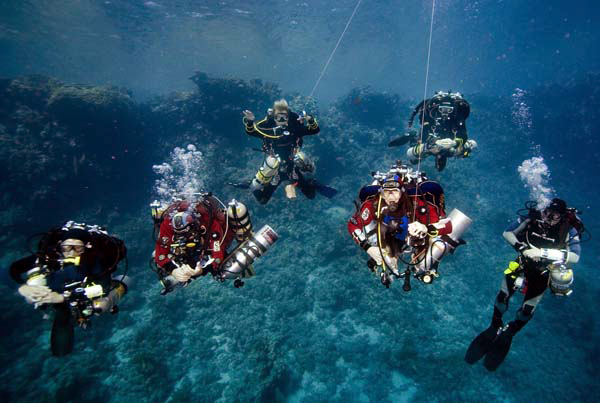 We made an additionsl day’s diving on the site again to 100m with the whole team. Everything was going very well. The weather was holding, the team was exceptional, and Leigh and I were both in great condition for the dive. Tuesday the 6th, after the last air dive, saw us in the gas blending station, Ocean Tec at Trafco, preparing for the first mixed gas dive the following morning. We hit a major problem within minutes of starting. Although we had a 300-bar compressor, we had overlooked the fact that we needed a 300-bar decanting whip for the blending panel. The mood changed as we tried everything we could to mate various parts lying around the centre to make a workable whip. Just as despair was setting in, Chad came to the rescue and called a local engineer who came down to the centre. We showed him a 300-bar spin tube and the high pressure decanting hose and simply stated that we needed “this bit to fit onto this bit”. This was met with a little scratch of the head followed by “no problem, two hours”. It was 8pm in the evening. Can you imagine this situation in the UK? We decided to have a break and went to dinner. An hour later, we received a call from Chad saying that the part was there. We paid the bill and hurried back to the centre. I must admit, I had my doubts, as the fitting needed an odd coupling to ensure a good fit. We put it together, and it worked a treat—not even a slight leak.